Interviewing seems an easy process, but not every time, especially when it comes to interviewing a celebrity. Although it is fun to interview a celeb, but it becomes quite tedious as a lot of research work is required. It is often difficult to make famous people give you an interview, unless you are also renowned and a public figure. Well need not worry as there are many ways by which you can interview a famous person. You should not start directly with the big stars as it is obvious you would not be able to reach out to them. So, in order to reach out to the bigger names in the public, you first need to interview the locally renowned people like the local singers, the artists, the theatre artist and so on. This way you will be able to reach the top of the ladder. Building connections mean making your name running in the eyes of others. You would not get a contact number of the celebrity, but certainly you would get celeb’s manager’s or the public relation officer’s number. u get that, do not just directly throw out to them that you want to interview. build some foundation initially, talk on some basis, so as they know you at the end of the day when the interview is to be taken. You need to do full research on the personality. Research would include all the work they are indulged in. For example, if he or she is a celebrity, then apart from the acting work, he or she might be doing some social work, or any other business may be. So, whatever the type of work they are indulged in should be taken into notice and also you must be informed about it. Then only you would be able to prepare your questionnaire and interview him or her. You need to be highly informed about your celebrity. What kind of work they do, what extra things they are handling and so on. Make sure you are well informed and not misinformed about the facts. So, to avoid this, you must be clear about all what you collect and read about the celebrities in the magazines. Although it is something so basic, yet it needs to be taken into the consideration. This is because when you are not polite or sound harsh, you may have to suffer the brunt of bad answers which will not prove good for your interview. 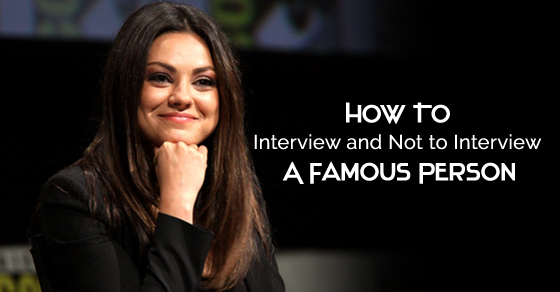 So, make sure you have a polite tone when asking interview questions for a famous person. Asking right questions is a key. What if you are interviewing a celeb from theatre background and asking questions related to science? It obviously will sound bizarre and infact the interview would fail completely. So, to prevent the interviewing failing, better to ask queries in one context. Do not go off track. Just remain focussed and ask as per the context and hypothesis. Preparing hypothesis will not just help you making right questions, but also the interview does not exceed the time limit as the queries are focussed around one thing. Celebrities hate media indulging in their life. So, whether you are a media person or no, if you need to interview a celebrity do not even try and indulge into their personal life. Do not ask any query related to any relationship, their salaries or anything which would turn into hype afterwards. The celebrities are busy with their shootings and other assignments. So, they might not know what you are going to ask. If you do not inform them or brief them about your topic, you might not get a decent reply so, it is better to tell them about the queries so that they can prepare little. Or if your questions would surprise them, then you might not get a good and fruitful output. You might be nervous, yet you need to be confident and above that first you need to be friendly. For that you need to first build a friendly space between both of you. This is necessary because if you will directly throw questions to them, they might feel awkward. So, it is better to be open with each other. Talk a little before starting the interview. Symmetry means in a particular order. That, of course, everyone knows, but this must be kept in mind while putting questions to the interviewee. For example, you should first must ask about the place he or she has come from, then about the struggle he or she did, then slowly and steadily you must reach to the final question. This is how you should move step by step. Also make sure you give time to the interviewee to respond and do not cut his or her answer in between. Let him or her speak and complete the sentence, then continue with the next question. Though, the controversial questions are inevitable however, you need to ask them as they are also related to them only. But always there are ways by which you can be polite, yet get the answers to the controversial queries. Do not just throw a blistering question on the interviewee, instead, be manipulative and then ask. The direct question has the probability to hurt one’s sentiments which is not the aim. So, be polite and smart while interviewing. So, above are some of the points that one should keep in mind while interviewing a famous person. You might not be equally famous like the celebrity as you might be a media person but not a renowned one. So, in this case, it is better to somehow reach personally and do not interview on phone. This is because, you might not get respond as expected. So, in such case, approach the person personally and then set the interview schedule. You should be well prepared as said. Over confidence can lead you in troubles at the time of interview. You should prepare yourself well and without wasting much time, start the interview as the celebrity might have some other assignments to fulfill. So, you are always expected to be on time and do not delay. Researching in front of the interviewee creates a bad impression. You might have to interview the same person any other time, for that it is better to make a good impression at first chance only. Also if you do research work at that moment, it could pinch or insult that person. As he or she might have to doubt his or her popularity for a while. So, you should not make the person think the same. You should keep in mind that once the impression goes bad, the same remains imprint in the mind of the receiver. So, it is your duty to make up your mind that you will not utter any of the offensive word that you use on a regular basis. Also make sure you do not speak anything which hurts the sentiments of the person. For that you will have to do some research work regarding the likes, dislikes, beliefs of the person. This will greatly help you in making the interview a success. You might be anxious or nervous, but the anxiety and nervousness should not lead to hurry. As you might have often read, haste makes waste. You should first relax yourself, should make the interviewee relax and then start with the interview. This way the atmosphere around you will be relaxed and also you will feel happy taking the interview. You are going to interview a personality, a public figure; for that you need to have smart personality. The looks does not matter but the body posture does. The right body language, brings the confidence and also comforts the interviewee. So, it is your duty to bring the person to comfort levels and make them feel home and easy. Your body language would do wonders if it goes in a right manner and if not, then you may lose the chance to interview him or her. When you are interviewing, make sure you do not fumble. If the interview has to go live, then your hard preparations must be done and if it is not to go live, then it’s fine but does not mean you have all the rights to make mistakes. Keep in mind to make less mistakes and concentrate while you work. Silly questions would only waste your and his or her time. Do not ask any off the track query. Even if you have it in your questionnaire, just omit it. This is because, neither the interviewee answers such questions, nor do they like. Not just this, the silly questions also wastes one’s time and energy. The straight questions are easy to answer. The complex questions are not answered easily. So, do not make a mistake of forming big complex questions. The long sentences have the capability to be misunderstood and forget one half of the question while answer just the other half, leaving the process incomplete. So, prevent that and ask short and straight forward queries except in a few cases. Not all are from the similar field of which you are. So, keep this in mind and prepare your questionnaire by using very simple and less technical vocabulary. The simple words are easy to understand and also saves much of the time of both the interviewer and interviewee. So, make sure your questions are easy and understandable in one read. You might need recorder, cameras and other things during the interview. These things should be with you at the time of the interview and should not have any technical fault in it. Any technical issue may result in a failed interview. So, be prepared beforehand as you never know , if you will get another chance to interview the same person. Even if you get, you might not get it too frequently. When you are taking interviews with famous people, he or she might not have enough time to spend on you. So, it is better to ask for the time he or she can devote to you. According to the time given, make the script or the questions. If you are short of time, then ask all the relevant questions so that no important one goes missing. So, above are some of the things one should avoid doing while interviewing a famous person. In fact, not just famous person, one should not do the above things during any of the interviews as they could be the important part of your project and none of the errors are acceptable. Next articleFemale Bosses Vs Male Bosses: Who is the Best?